This easy Bow Tie look quilt block pattern is a very good choice for beginning quilters. You might also consider the design for quilt block swaps among friends because quilters of every skill level can stitch it perfectly the very first time. Grab a rotary cutter and ruler and you'll be ready to start sewing in no time. Try another of my patterns if you're looking for a quick pieced Bow Tie quilt block pattern that's easy to make without set in seams. Quilt blocks finish at 8" x 8". Follow the instructions to make two identical quilt blocks. Stitch up more blocks if you want to assemble a quilt. Use a 1/4" seam allowance for all seams. Cut all pieces so that the fabric's straight grain is parallel to the outer edges. Read a few strip piecing tips for quilters if the technique is new to you. Use straight pins to keep matched edges from shifting. Align an 11-inch long dark strip and 11-inch light strip right sides together, matching all edges. Sew the strips together lengthwise. Press to set the seam. Press the seam allowance towards the dark strip. Square up one end of the strip set and cut four 2-1/2" segments. Align a unit from Step 1 on top of a dark rectangle, right sides together and the light portion of the strip-pieced unit on the left. Sew together along the top edge. Press the seam allowance towards the rectangle. Repeat to make a total of four identical units. 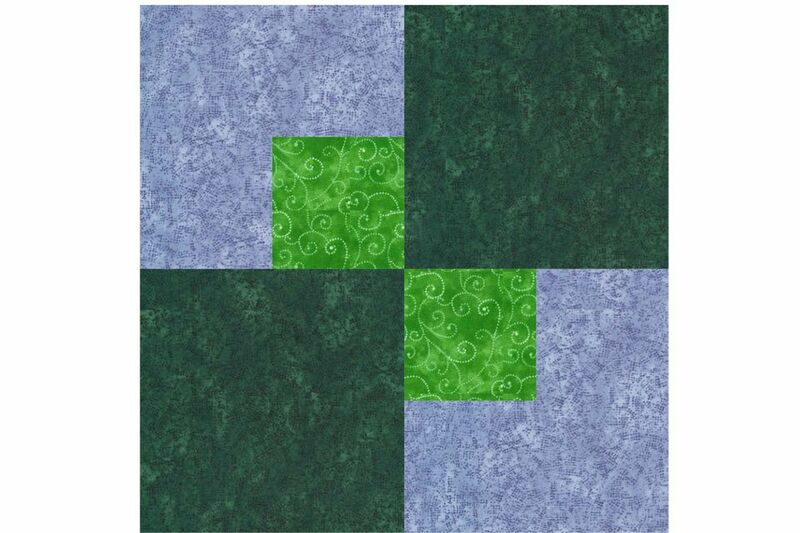 Sew one of your pieced units to a 4-1/2" medium square. The small light square should touch the top edge of the large square. Press the seam allowance towards the large square. Make three more identical units. Sew two units from Step 1 together as shown above to complete the block. Press the seam allowance either direction. Repeat both steps to make the second quilt block. The Bow Tie look quilt blocks could be arranged into a vertical 'strippy' setting, with quarter square triangles surrounding each block. Refer to the instructions for cutting quarter square triangles and learn how to cut setting and corner triangles for quilts.